The OST to Lotus Notes Conversion Software is deployed with rapid migration algorithms that are used for exporting OST files to Lotus Notes environment. It is established with the lowest footprints of the .exe file installation. This is offering instant scanning and fastest migration speed. OST to NSF Converter migrates unlimited GBs of data consuming in less conversion time. 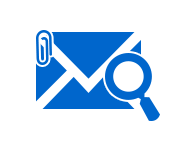 Apart from this, all OST folders like emails, calendar, contacts, and other user-created folders are transferred in NSF format. 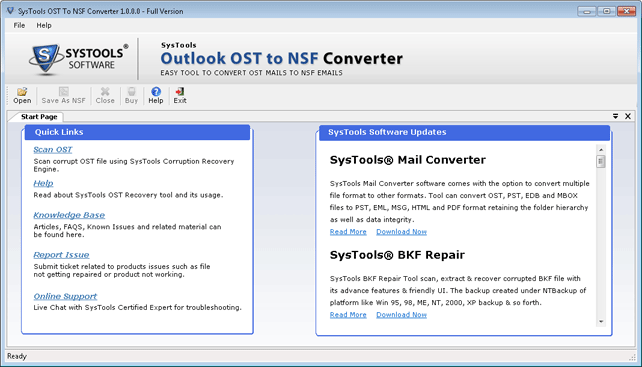 Outlook OST to NSF Converter Tool is having an inbuilt feature to preview retrieved data items. Once the tool thoroughly scans .ost file, it loads all data on its preview wizard prior to the conversion. Based on the attributes, one can arrange the items listed in a preferred manner. Users will be able to preview emails with their respective attachments. 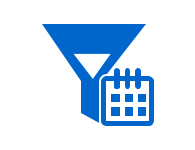 Message properties like Subject, size, received time, sent time, from, and To are displayed in the tabular form for analysis. This feature makes the OST to Lotus Notes Conversion Software a multi-faceted application because extracted OST emails can be stored in a particular date range. Offline OST to NSF converter is supporting batch email conversion. Users just need to check/uncheck items or folders that they want/don't want to export. Apart from this, the migrator prompts a choice to save file on the desired location. It is possible to create a New Folder directly from software panel and then save output NSF into it. The fully interactive and a simplified user-friendly interface makes the software an easy-to-use tool. It can be accessed both by technical as well as non-technical users without the requirement of any prior knowledge. Well, the application requires Microsoft Outlook installed on the machine for working on it. 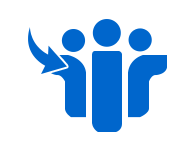 Any version of Outlook will be supported by this utility. 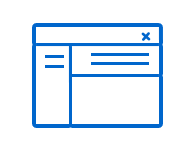 It is guaranteed that it will maintain email integrity and folder hierarchy both, at the time of conversion. 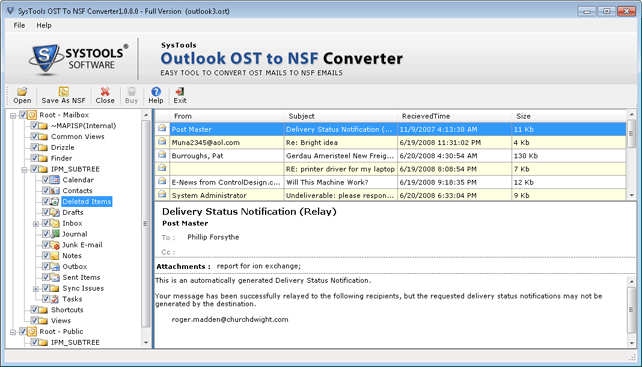 Trial Version Of Outlook OST To Lotus Notes NSF Converter Preview Recovered OST Data. Lotus Notes Client should be installed and configured properly. Lotus Notes Client should be disconnected from Domino server. 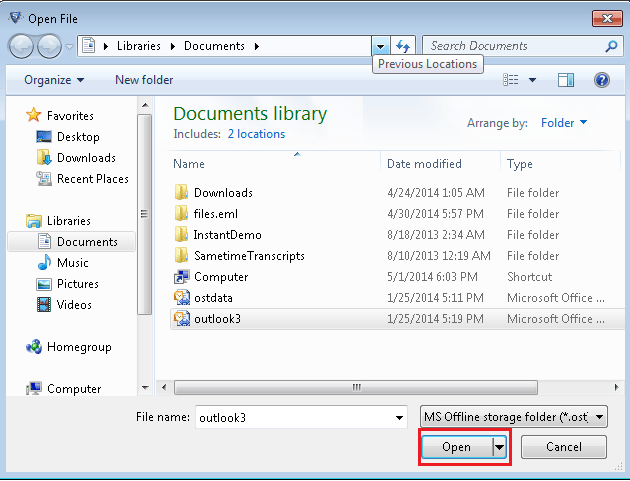 Will you software support emails of orphaned Outlook OST files? Yes, our tool is designed with a set of strong scanning algorithms. These algorithms extract messages from orphaned as well as corrupted OST files. I want to convert OST file of 5.60 GB size into IBM Notes database file. Does your application supports file of such big size? Yes, of course, there is no file size limitation imposed by our software. Offline OST to NSF Converter is capable of converting an OST file of unlimited size into NSF format. Is there any scope for converting bulk OST files into NSF with help of this FreeViewer product? No, our software is designed with the capability of migrating one OST file of any size at one time. This means that bulk migration is not supported by our tool. Can I use Microsoft Outlook 2007 as a supportive application for your converter? Yes, only Outlook installation is mandatory for working with our software. There is no issue whether the version is older or latest, our product is compatible with all. Is there trial edition available with all qualities of full and licensed version? No, our FreeViewer product offers only free viewing of OST data with its trial edition. In the case of conversion, you have to purchase the product from our official website. "I had a quite long conversation with the support team for migrating my Offline OST files to IBM Notes NSF file. Throughout the communication process, the team was guiding me in a very calm manner. I utilized this product in the way the support team was constantly telling me. And in a very smooth manner, I was able to convert OST into NSF format." "Actually, I am glad that I got a chance to connect with FreeViewer! The applications they design are having high accuracy and features that overcome all the challenges faced at the time of conversion. Recently, I used OST to NSF Converter software that exported my 1500 + mailboxes of OST file into Lotus Notes. Thank you guys!!" 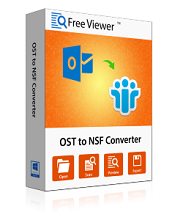 "I am glad that I used FreeViewer OST to NSF Converter tool for migrating all the data items from Offline Outlook OST file to Lotus Notes NSF database file. It was easy with the help of this tool. I was completely from a non-technical background and I don't know how to do this task. But, this utility made my work done on time and without any hassle." "I must that this tool works really in an effective way. It takes a very less time to convert OST to Lotus Notes NSF file. The interface of the application is quite easy that I didn't get any problem related to the conversion process. The experience of using this tool was good and satisfactory. Thanks, FreeViewer!"